A few odd and sundry bits rolling off the workbench this week – mostly fantasy stuff, ostensibly for A Song of Blades and Heroes. Not for A Song of Blades and Heroes… but possibly for Fear and Faith or A Fistful of Kung Fu – Hong Kong Movie Wargame Rules…? A strange man with a Hitler-like hairdo and moustache in a ballet costume (that’s much to small) and rubber boots (because… you know… that will come in handy in SOME game!?) and the infamous William the Bloody. 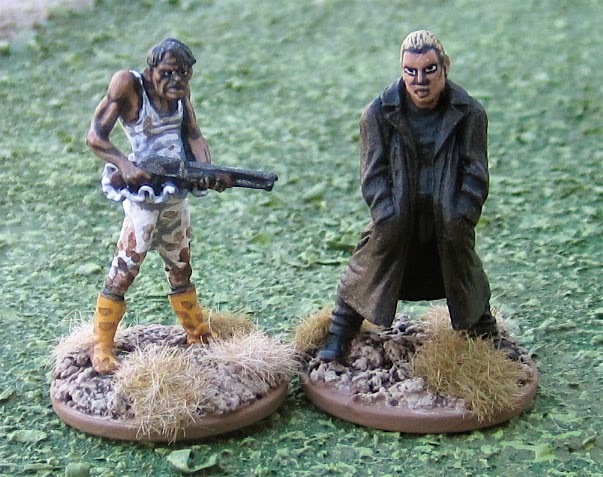 Both are from Hasslefree Miniatures. A batch of Wimyn Warriors from Mega Miniatures - one of those 20 minis for $20 or whatever it was… I bought it a few years back. There are a few gooders in this pack – I like these ones! 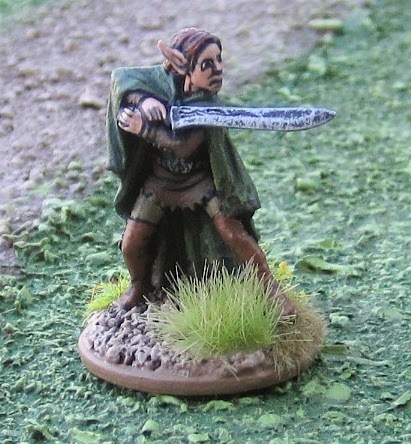 Mega Minis are some time pretty hit-and-miss… Some in the pack are definite misses - there’s a few with the unimaginative standard Fantasy Female Armour. 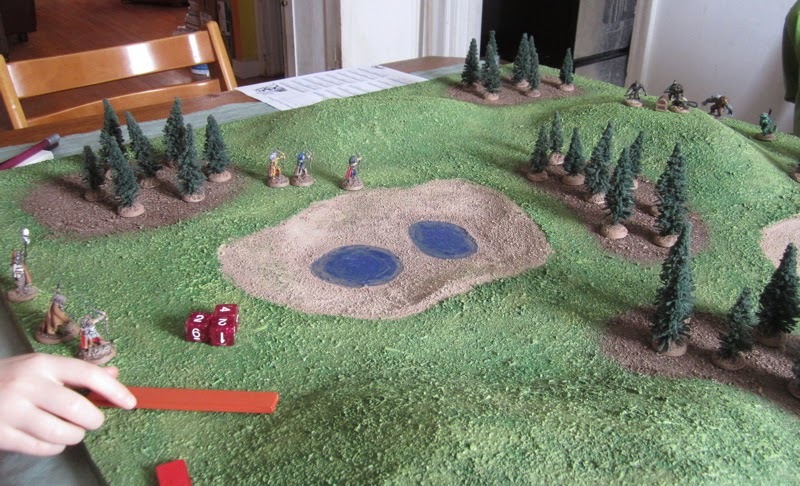 Round three of our Song of Blades and Heroes/Song of Deeds and Glory campaign. 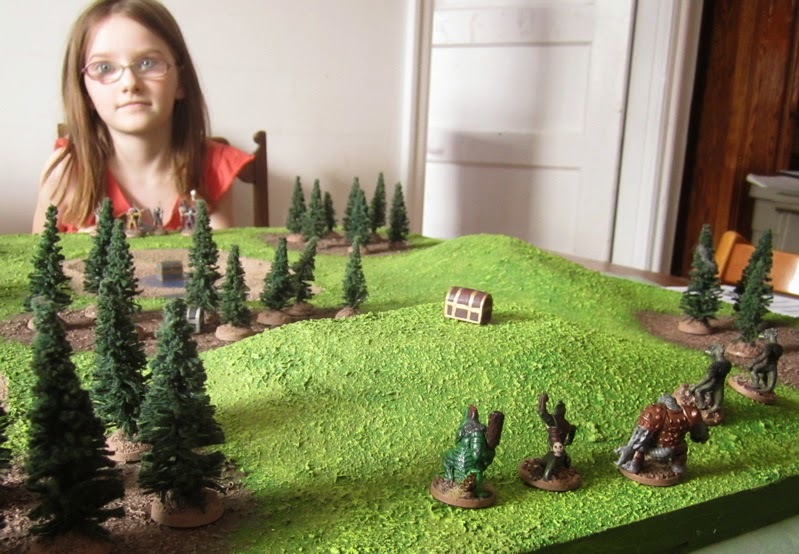 Amanda joined in a squared off against Keira, while I battled Finnegan’s lizardmen again. 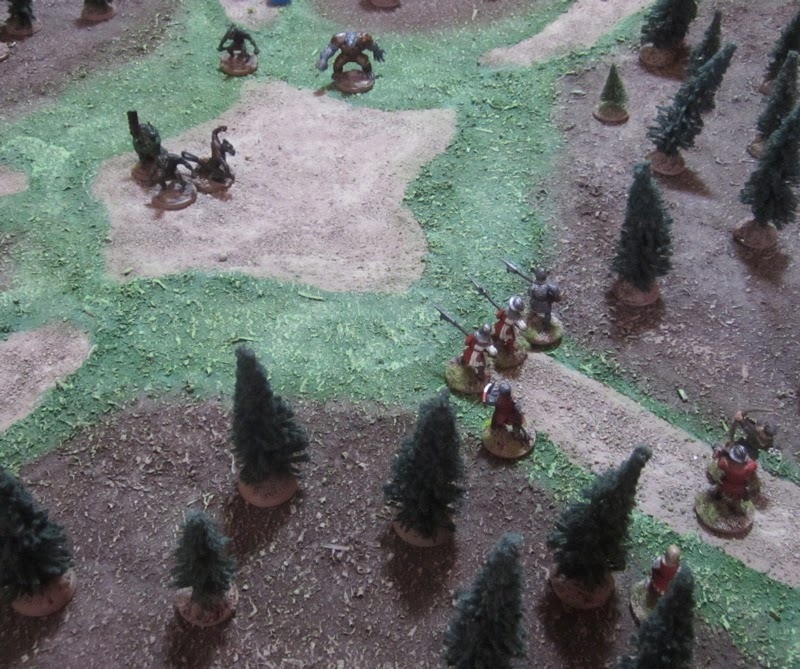 The Battle for Boglen Wood Rages On! On Friday Keira and I played against each other for our respective second games in the Song of Blades and Heroes campaign that we started the day before. Both fancying ourselves “good guys” we were hard pressed to explain WHY we’d be fighting at all. 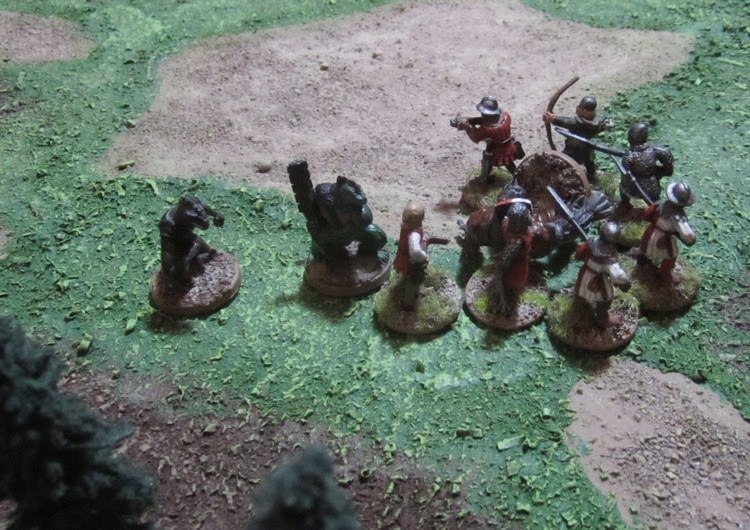 I figured perhaps it was a case of mistaken identity – both parties assumed the other was a group of bandits that had been dogging them for sometime and decided to finish the matter by attacking! 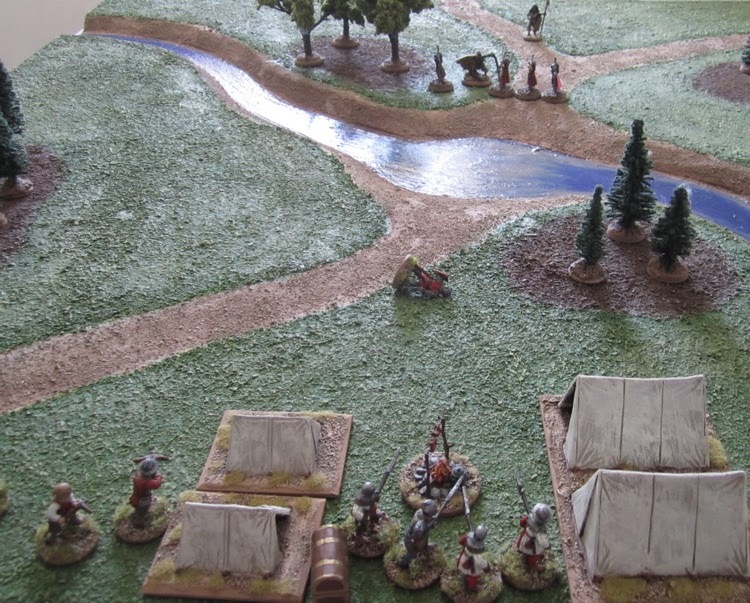 As it turned out Keira was the attacker so I set up a little camp along my edge of the board and said that Baron Philipe’s men had set up camp in a location the had seen others had used – figuring it might be bandits and by sitting on their camp the bandit’s might come to them. As the sun began to fall in the west they fancied they spotted their quarry silhouetted on the western horizon. Keira receiving some tactical advice from her brother. 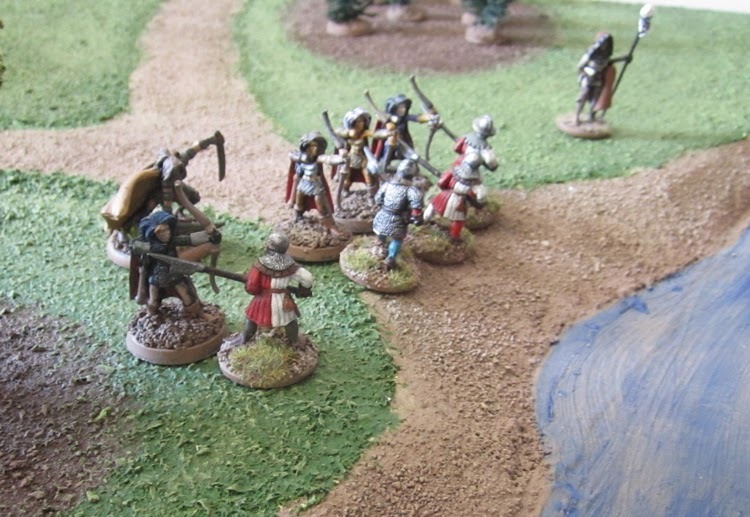 Baron Philipe’s men quickly rush to their arms to defend against the attacking bandits. What is with this rolling turn-overs for my first move!? This is BS! Once again the Phillipe charges out – only to find no one is following! Keira took advantage of this – trying to make the poor Baron look like a pin-cushion! The baron tripped and fell to the ground, trying to dodge the swarm of incoming arrows! Keira rather enjoying this turn of events. Again I started with the Baron… and AGAIN he rolled a single action and a turn-over!? Seriously…? SERIOUSLY!? It was only after he got back up again and called them a bunch of sissies than they finally sprung to action… in TURN THREE!? 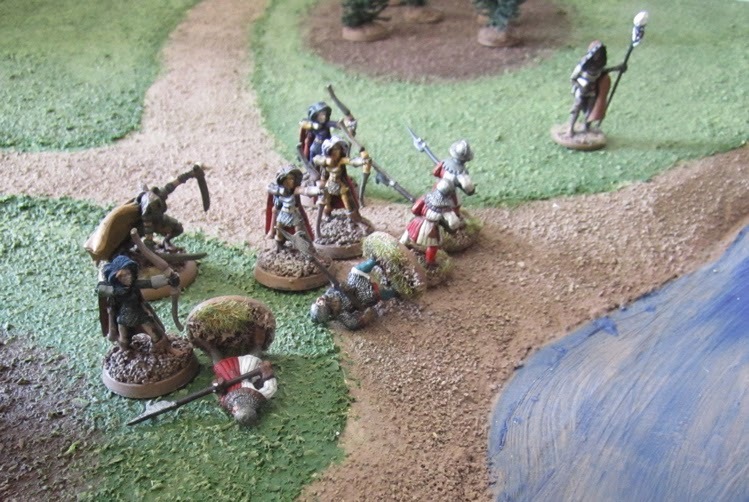 Keira also had some trouble motivating her troops to get going – this was her leader’s roll she was going to attempt to order the FOUR ELITE ARCHERS to try a concentrated fire group action – which surelywould have been the end of the poor Baron – at least for this action. 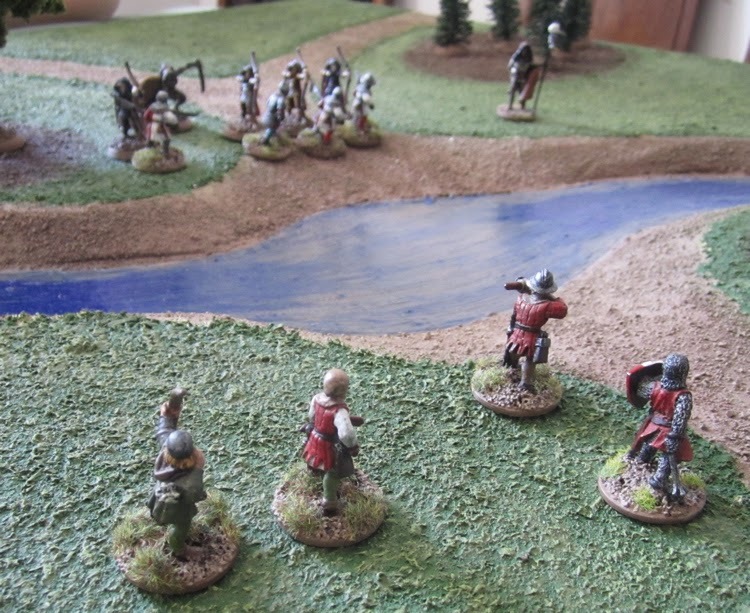 Having seen their master fall in a hail of arrows, then get back up again and call them sissies – the Baron’s men-at-arms finally sprang to life and rushed towards the ford. 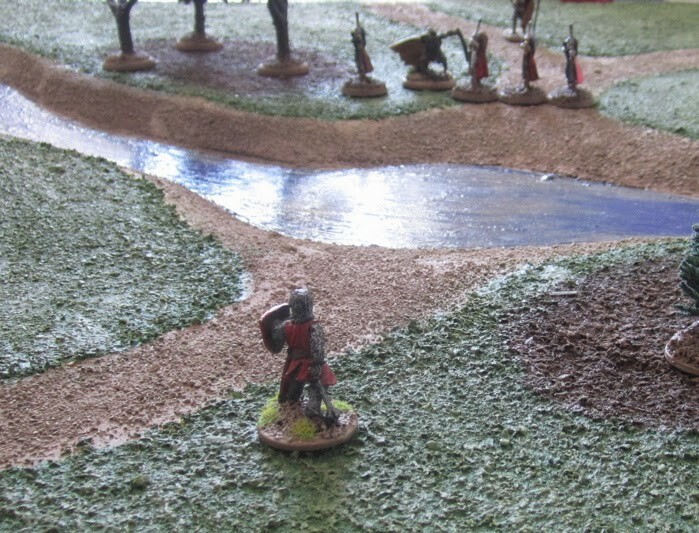 The Men-at-arms rushed across the ford and into contact with the enemies archers, while their own archers and crossbowmen fired on the enemies leader and mage. 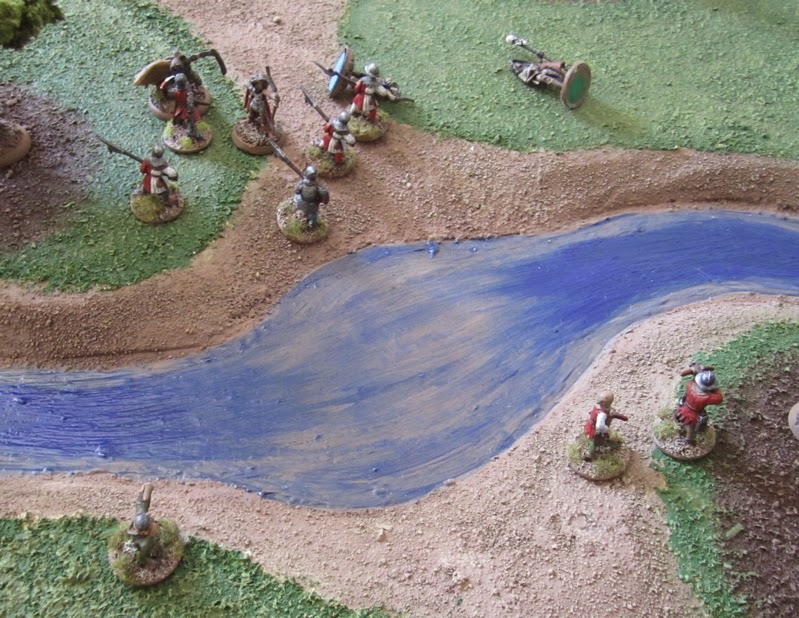 The Enemy archers dropped their bows and drew their swords to meet the men-at-arms rushing at them out of the river. 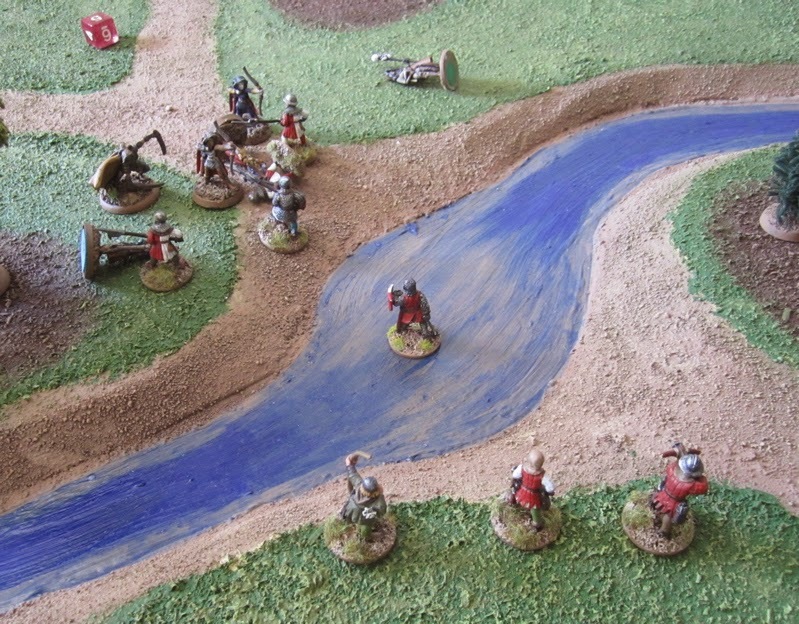 The battle continues another round – men-at-arms got up and knocked Archers down, while another of their own slipped and fell in the melee. The Baron’s archers managed to hit the enemies mage – or at least made her drop to the ground to avoid incoming missiles. The Baron himself finally started making his way across the ford. 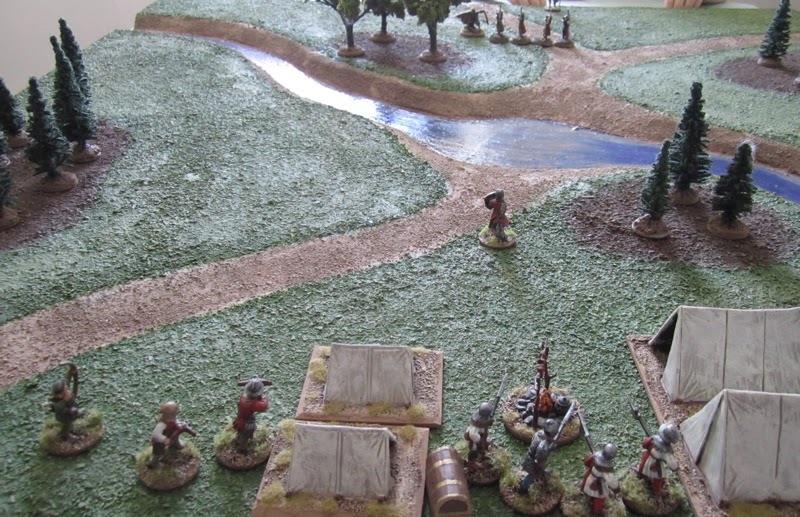 The final round went poorly for Keira’s explorers – two of the archers were knocked down and out of action and the Barron finally made his way out of the ford and into contact with the leader. At this point she conceded the game, but I said it was more likely that once Baron Philipe got into contact with the “enemy” leader he probably recognized her, and she recognized him, and they both said “wait a moment – you’re not bandits! ?” and both leaders called on their troops to stop fighting! Still I claimed a victory and another campaign point and five more victory points for taking down the two Elite Archers. 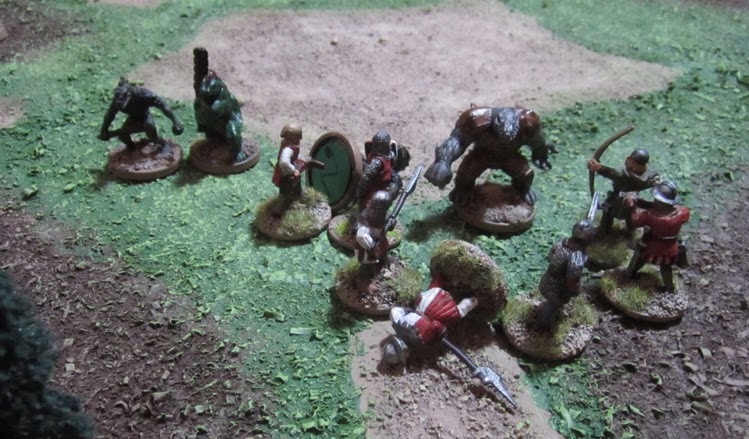 The archers, it turned out, weren’t too badly off –one will completely recover by the next game and the other had had her bell rung and will be at reduced quality (Q4+) for a game. 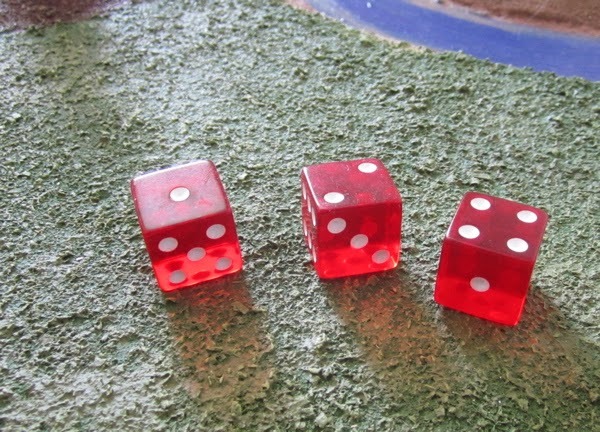 Keria – having lost two games in a row – claimed the underdog bonus and took in 50 gold for income. My income was reduced (because of the Murder of Crows we’d spotted while exploring after the last game) and only took in 30 gold. Keira hired another Human Warrior and I’m contemplating doing the same. Keira came across a small shrine in her explorations but decided against paying and praying to try and win the favour of the gods. I, on the other hand, discovered and abandoned alehouse and added it to my domain! Huzzah! So now I can get one of my guys liquored up before battle – giving him a better combat value, but reducing his quality! (or I can just sell some of the booze after every battle for an additional 5 gold. A couple things I have noted about this campaign system - while it is possible to improve Quality and Combat and gain certain special rules, you can not gain Good Shot or Unerring Aim...? 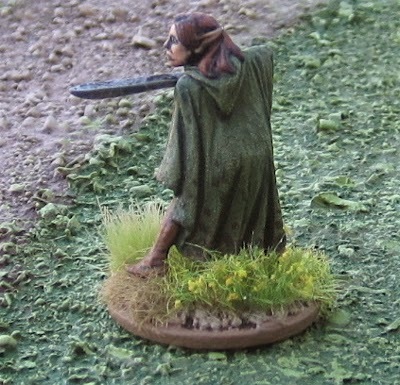 As a Human Elite Archer (with unerring aim) is only 6 points more than the regular archer, it's probably better to just get the elite archers at the start of the game... Also, halflings have no leaders in the list. I know, it's really easy to come up with one with the point calculator, but I was wanting to stick to the lists for generating warbands for campaigns - lest anyone come up with something ridiculous... I suppose there is the "Theme Vote Rule"... but I'm thinking of the game weekend I'm planning to host in June. I was going to have the players bring their own damned warbands for once (usually at these things I've supplied all the warbands) but to keep players from doing anything silly I was going to say they have to stick to what's listed in the four books.... Hmmmm.... We shall see. I suppose I could say anything in the four books is okay, you can come up with your own stuff, but it will have to be voted on by the other players so have alternatives ready if you abomination gets voted down!? The next round of the campaign – Hopefully we’ll get Amanda in on the action tonight! After that..? perhaps the next round... or some newly painted stuff! 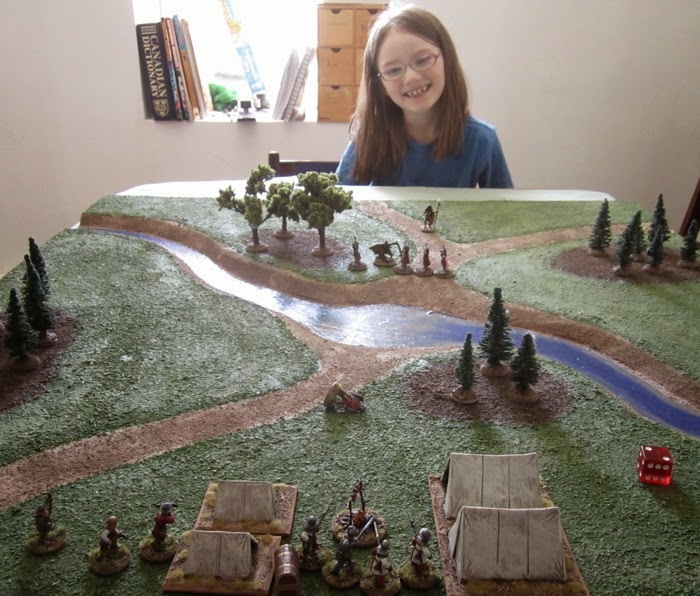 We finally kicked of a campaign for Song of Blades and Heroes this week, the kids and I. WE are using the advanced campaign rules from Song of Deeds and Glory. Hopefully Amanda will join in the shenanigans when (if) she has a chance. I said we’d commit to a short, six game campaign just to try out the system. 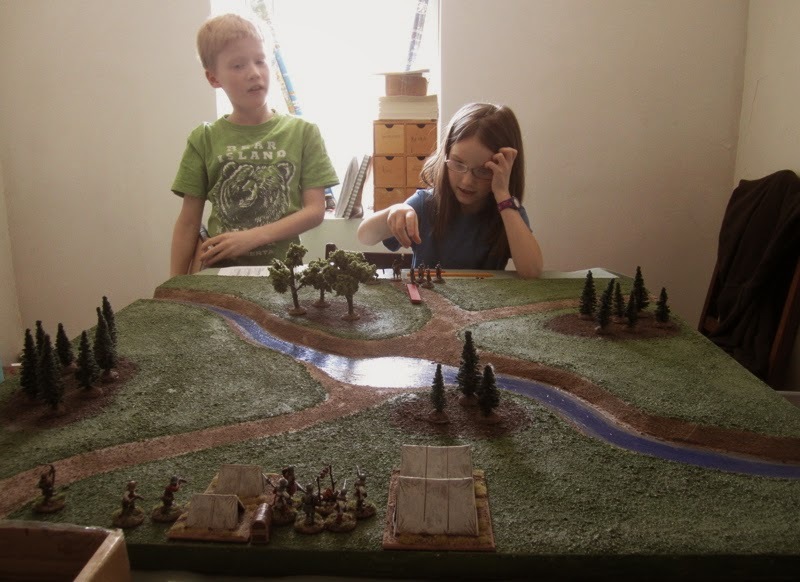 To start off Finnegan and Keira’s warbands played a Treasure Hunt scenario – they decided they were looking for a clue for where the ancient magical artifact is hidden. 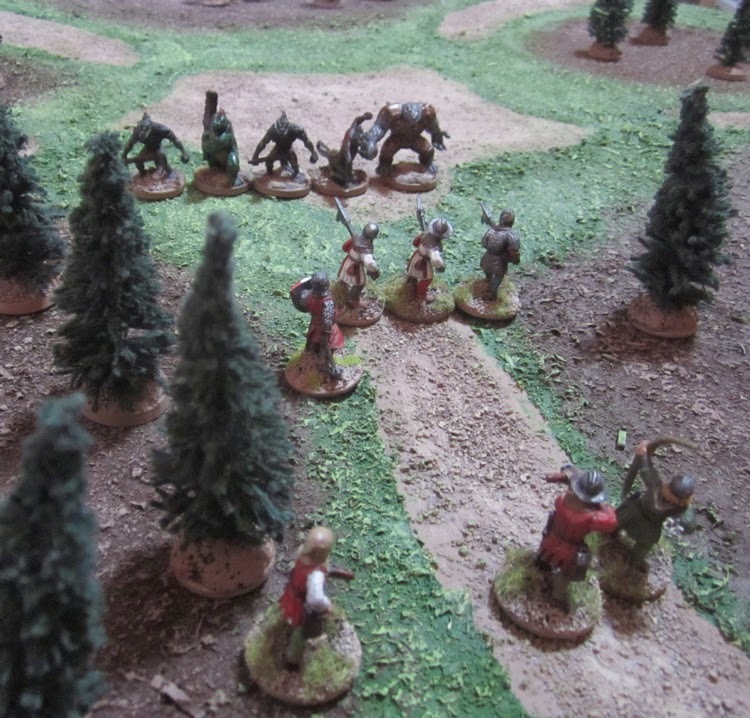 The Baron and his men enter the woods. The Baron rolls two failures on his first activation. 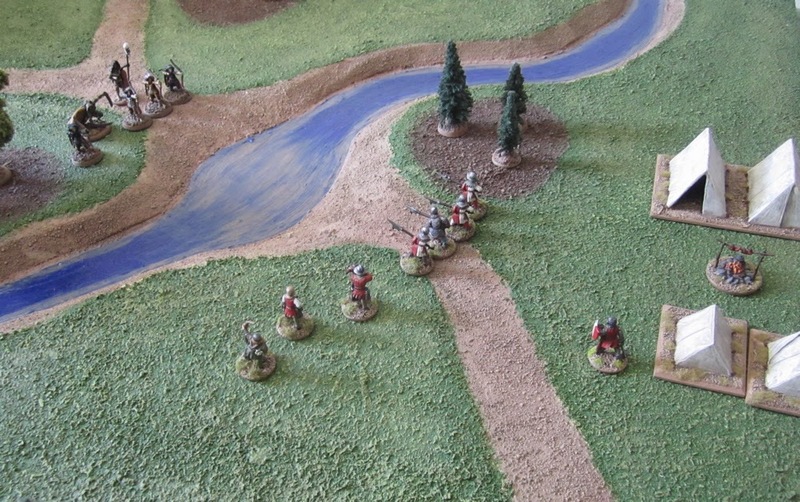 The Lizard’s rushed across the table and Baron Phillipe’s Men-at-Arms rushed to meet them on their second turn. 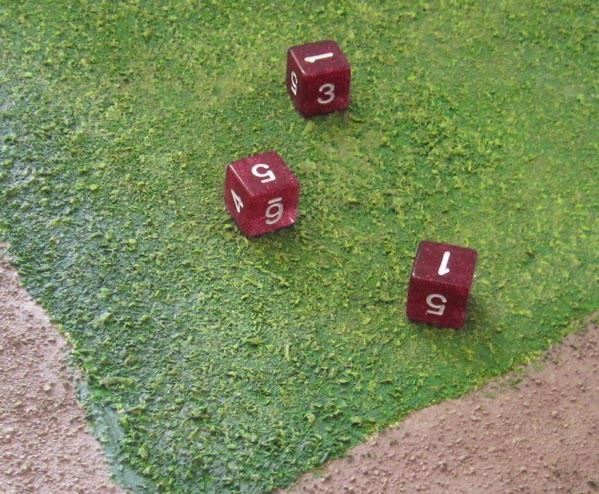 I, on the other hand, was plagued with crap combat rolls… Archery fire caused one recoil in the entire game. Man I hate fighting “Tough” characters… They are SO hard to take down… Not impossible, mind you, but very, very hard. With my bonus cash I recruited another man-at-arms; Louis – another foot warrior. Finnegan’s run out of Lizardmen so he’s had to recruit a Bugbear. Keira only wanted to buy a spell scroll for her Wizard’s Apprentice. 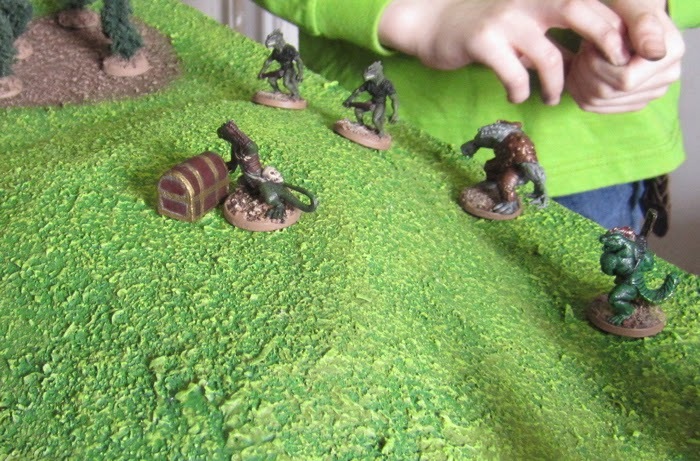 The next round of the campaign – Keira’s and my own humans battle it out. I would like to get some factions together and play a few games of A Fistful of Kung Fu – Hong Kong Movie Wargame Rules… to get a decent campaign going on I’d have to build a lot of new urban terrain – to look like Hong Kong or “Chinatown”… and I’m a little more taken with the fantasy subjects at the moment. Summer Song of Blades and Heroes Campagin? And what about Toon Con? Maybe a 1914 Great War Battle? The centenary of First Ypres would be right around that time…? Back to our regularly scheduled programming of newly painted figures and game reports! I have some bizarre oddities on the workbench, not sure which is going to be done next (I’ve been a bit distracted with all this “planificating”) and it’s about time I got in a few more games of A Song of Blades and Heroes with the kids… maybe even get that campaign started! As I mentioned in the previous post I am back to working on the Vimy Project. The short version of all that is that on Sunday, 9 April 2017 – on the centenary of the event - I’m planning on staging a massive game of the Canadian Corps’ attack on Vimy Ridge. To do this I’m going to have to acquire and paint a division worth of minis for the Canadians each year between now and then, as well as make miniature terrain of the ground over which they fought AND acquire (or cast) and paint the opposing Germans. I’m going to do the 3rd Division… I’ve already done the 8th Brigade and one battalion of the 7th Brigade (42nd (Royal Highlanders) Battalion). I need to finish painting the rest of the 7th Brigade (which I already have the miniatures for – except for a Trench Mortar and crew…). Then I need to acquire and paint the 9th Brigade (probably from Brigade Games). 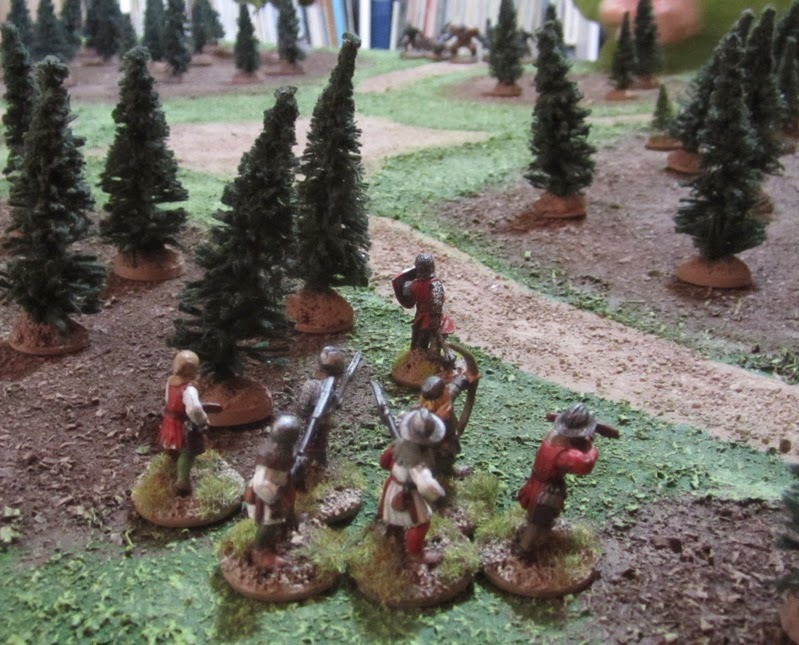 Despite having my own miniatures that I could cast as many as I like of… I decided I’d do a brigade of miniatures from each manufacturer that do late war British/Canadians. I know… it’s a bit daft… but that’s how I roll. 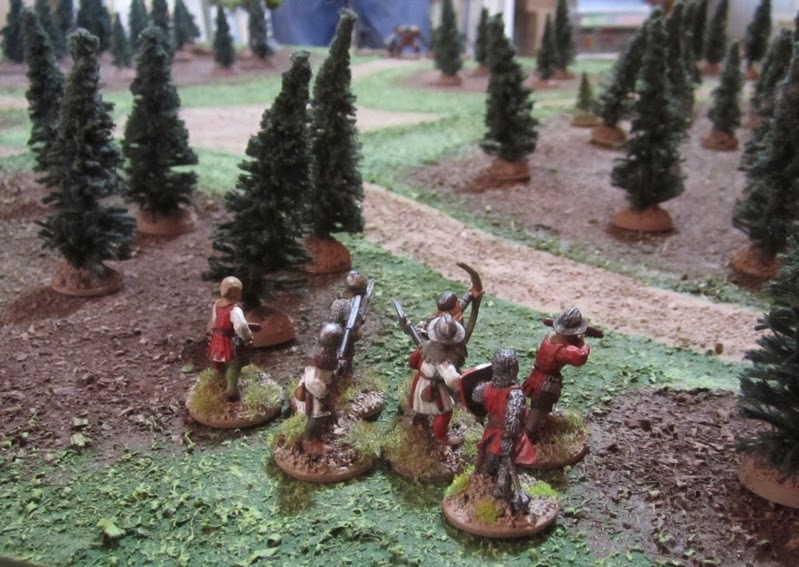 That’s a total of seven Canadian and six German battalions to paint – or about 200 figures. Very do-able. 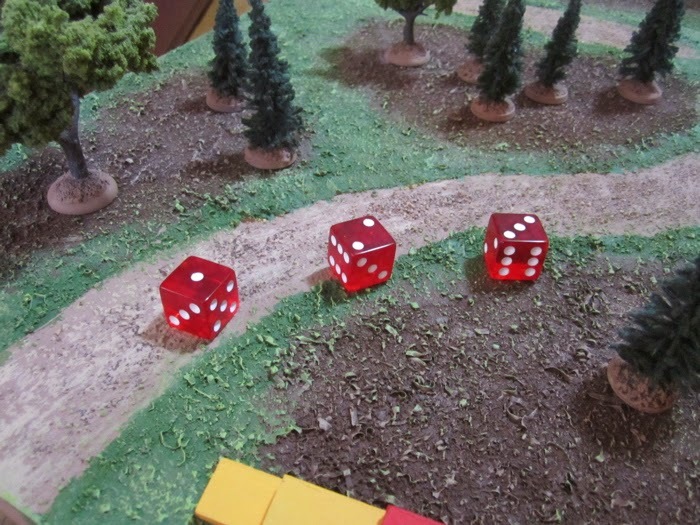 I also need to build terrain for the 3rd Division to fight over. 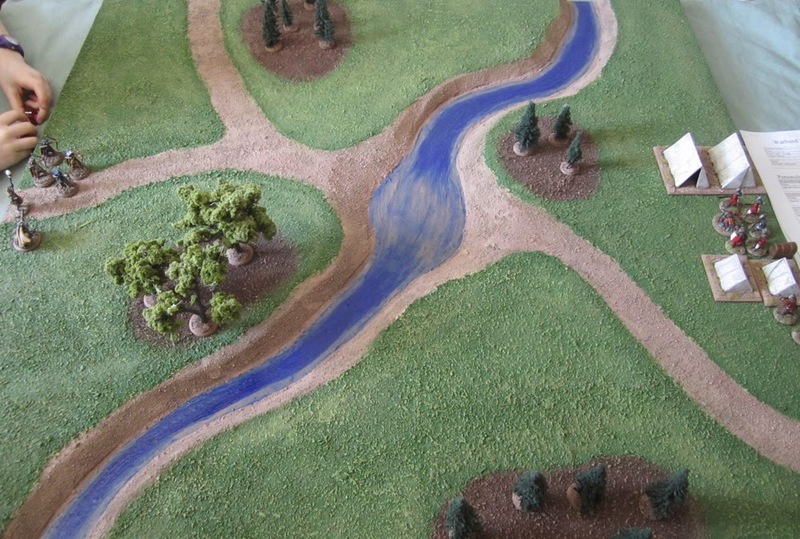 But I’ve been building a lot of terrain lately, so that shouldn’t be too difficult… and I need to finish fixing up the 4th Division’s Terrain. I started this process a year and a half ago, but then lost steam and only managed to finish one of the four terrain sections. The terrain will get a bit more challenging each year as the area fought over gets larger. In all that’s 28 Battalions of Canadians I need to finish up and 12+ battalions of Germans (let’s say about 17 – including the bonus reserve battalions). That’s about 700 infantry to paint in the next three years. There’ll be a bunch more – guns, MGs, mortars, brigade and regimental commanders… let’s say 800… That’s a little less that what I’ve been averaging the last few years – so if I manage to only spend 1/3 of my hobby time for the next three years painting Vimy stuff I should have little trouble getting it done! More planning for 2014 - what to do with the rest of the year... besides all the Vimy Stuff? My final entry to the Fourth Annual Analogue Hobbies Painting Challenge - a nice 300 point bomb. The 8th Infantry Brigade was part of the Canadian Expeditionary Force's 3rd Division in the Great War. It consisted of four battalions of "Mounted Rifles" which had been originally been raised in late 1914 as 8 regiments in two brigades. Upon their arrival overseas, however, it became immediately apparent that there would be no role for mounted rifles anytime soon and were thus "dismounted" and amalgamated into four regular infantry battalions. These are all to be part of my "Vimy Project" - a megalomaniacal dream to play the entire Canadian Corps' assault on the ridge on the 100th anniversary of the battle in 2017 (more on all that shortly!). 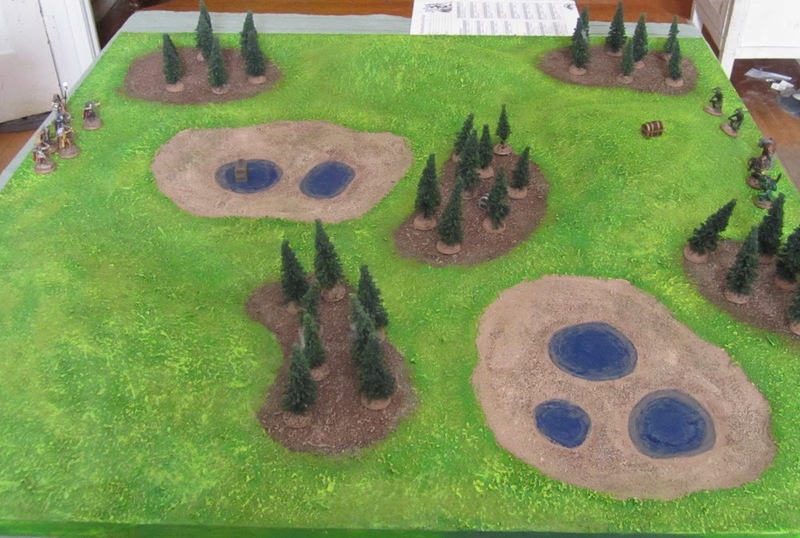 So far I have done the terrain and miniature for the 4th Division (and the opposing Germans in their sector). This year I am doing the 3rd Division and terrain for it's section of the line (and the Germans opposite). Next year will be the 2nd Division and in 2016 I'll finish up the 1st Division - so I'll have the entire Corps (and terrain... and Germans...) ready for early 2017. 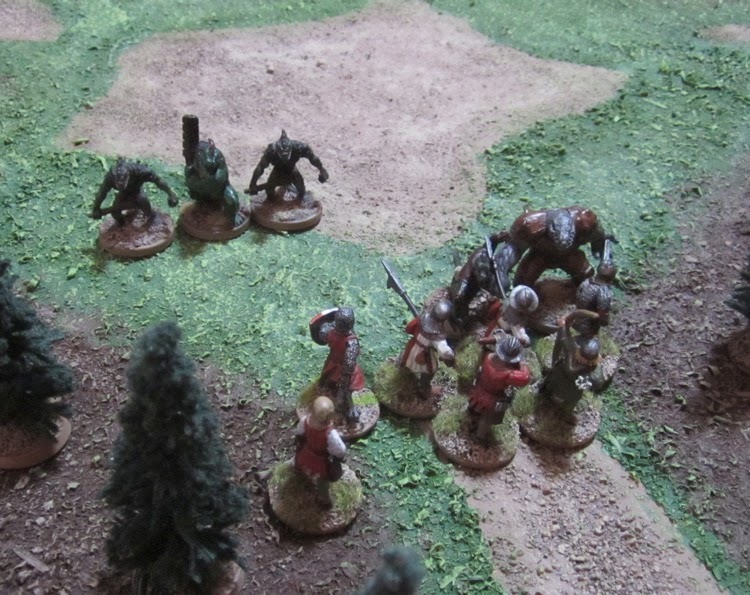 The entire Fourth Division was made of miniatures I modeled, cast and (of course) painted myself. Later, I got the idea in my head that the rest of the Divisions I would do making up brigades from various different manufacturers. The 8th Brigade, here, is made up of models I picked up from Renegade Miniatures a couple years back during one of their 5-4-4 sales. 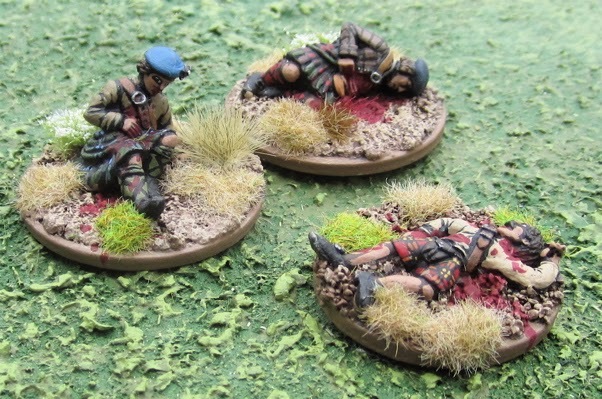 I also have miniatures for the 7th Brigade - which are all Great War Miniatures - and so far I have painted the 42nd (Royal Highlanders) Battalion (which was, apparently TWO YEARS AGO!). I'm not sure what I'm going to do for the 9th Brigade...? 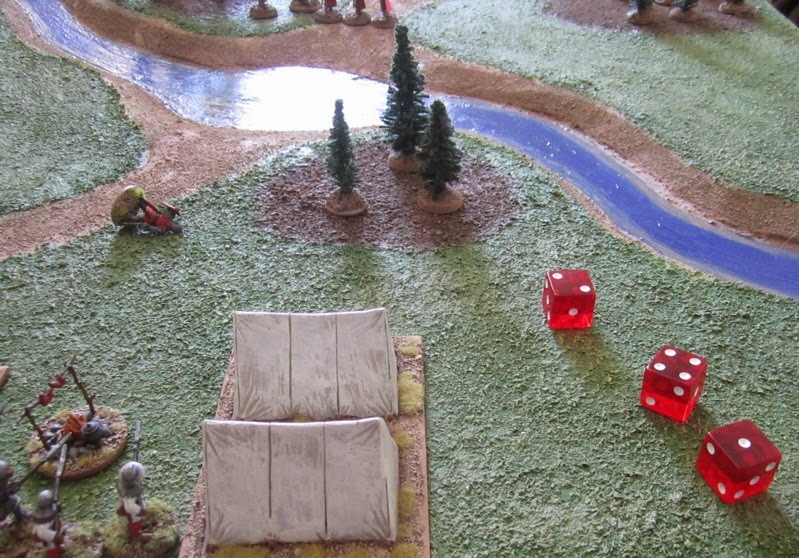 Probably Brigade Games - as there is a highland unit in the 9th Brigade (Camerons of Canada, I think?) 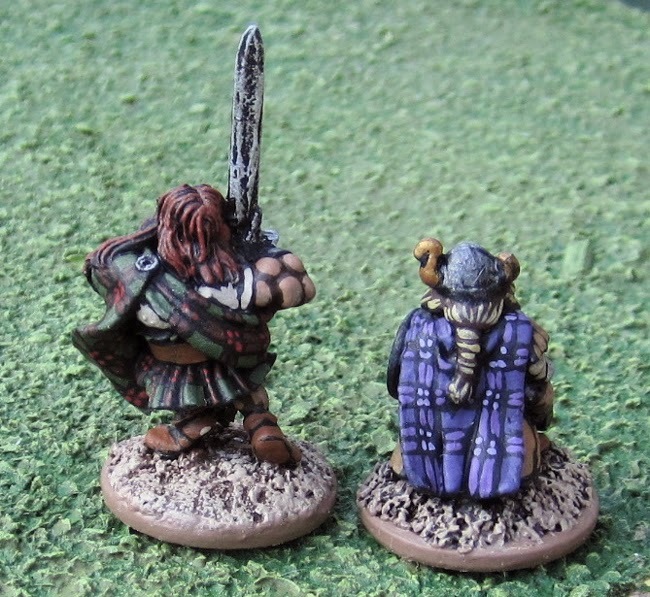 and Brigade has Highland figures - which some of the other manufacturers don't!? First Battalion Canadian Mounted Rifles - which my Great Uncle Bertram served with at Vimy Ridge! Well now what…? I think I should do some planning for the next couple months and maybe do an update on the Vimy Project… It’d be nice if I could maintain momentum on this and finish up the 7th Brigade – as I already HAVE those figures, they’re all based and primed and ready to go, and one of the battalions is already painted! 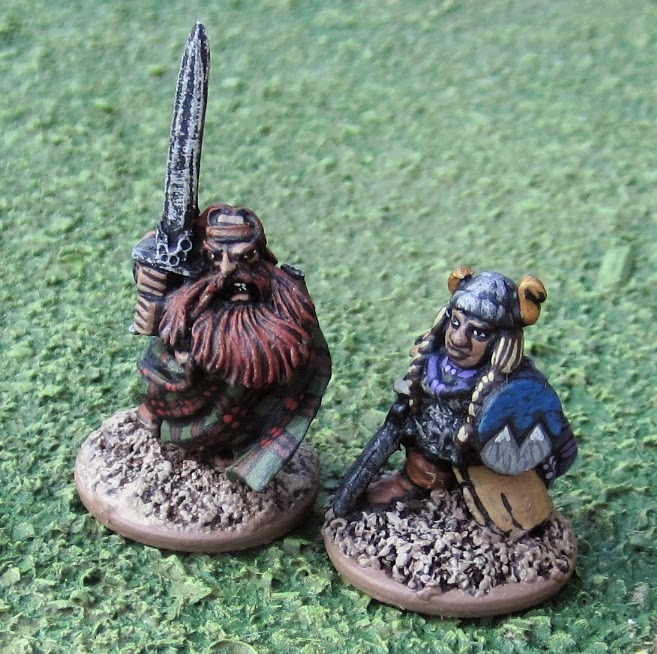 The fella is from West Wind Productions Dwarf Wars line, and the lass is an old Citadel Minatures pre-slotta-base-era miniature I picked up off ebay a while back. 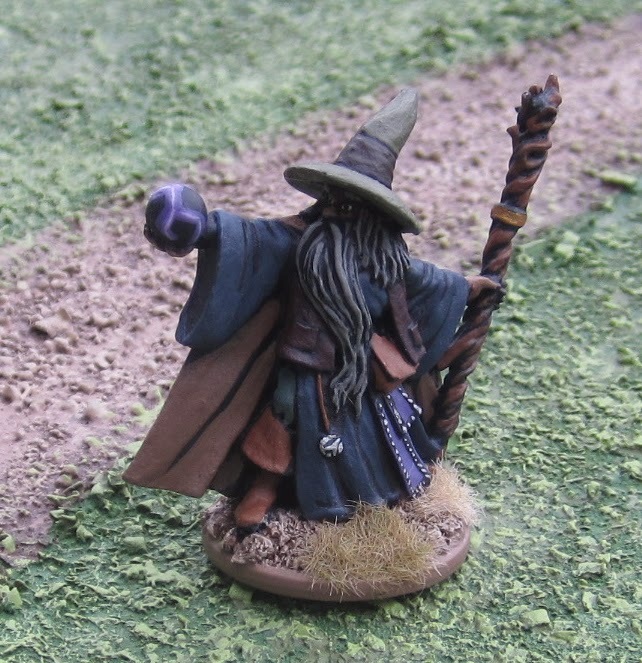 A wannabe-Gandalf-type wizard from Reaper Miniatures. 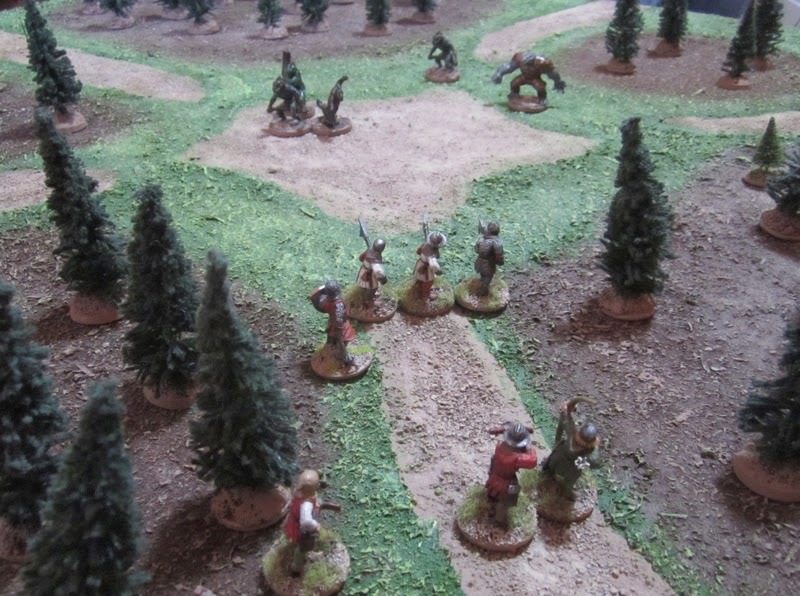 The 8th Canadian Infantry Brigade and an update on the Vimy Project, and probably some more figures for A Fistful of Kung Fu – Hong Kong Movie Wargame Rules. A few assorted Mediaeval Warriors I will use as humans in A Song of Blades and Heroes. These halberdiers are painted in the livery of my old Brettonian Hero from my Warhammer days Philippe du Lapin. I wasn’t sure of the manufacturer of these as I got them in a trade. I originally thought they might be Old Glory (as they came in a bag of 30) but then seem… well… “too nice” to be Old Glory… as it turns out they are from Front Rank Figures - thanks to Juan for identifying them! 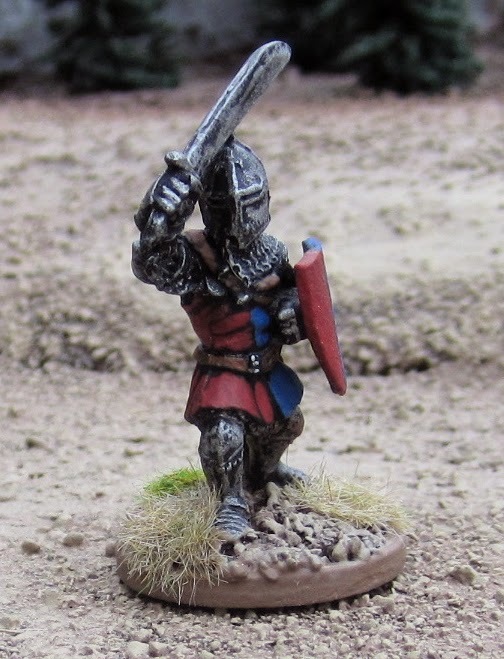 This foot Knight is, I believe, from Wargames Foundry. It is yet another figure I’ve had for decades and have stripped and repainted. 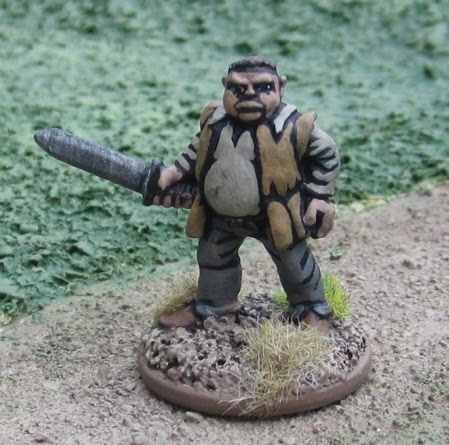 A generic Mediaeval Thug from Mega Miniatures. My final entries in the Fourth Annual Analogue Hobbies Painting Challenge - some more minis for A Fistful of Kung Fu – Hong Kong Movie Wargame Rules and the 8th Infantry Brigade CEF for the Vimy Project. This weeks final Theme Bonus Round at Fourth Annual Analogue Hobbies Painting Challenge is “Last Stand”. I had a hard time coming up with something… I didn’t really give this much thought early enough to make any decisions and by the time I started thinking about it, it was too late to be ordering new minis... So I had to come up with something for a last stand that I actually had minis for. Originally I thought I’d do Isandlawana. 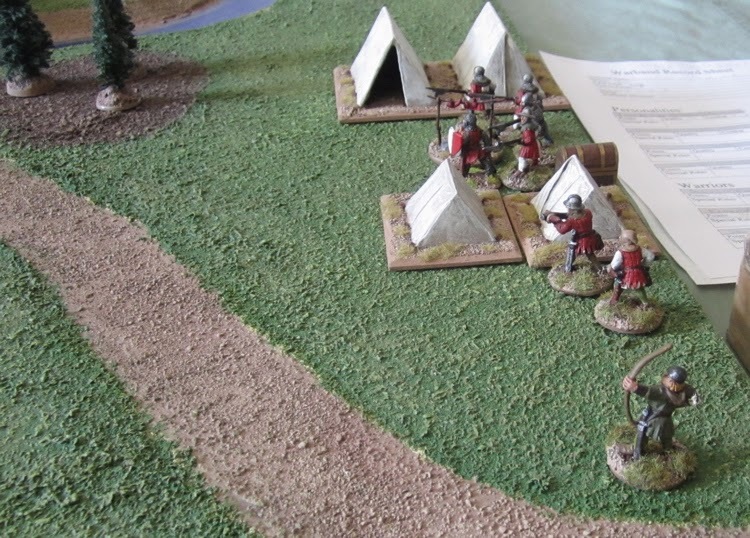 I have a pile of Zulu war stuff to paint – English, Dead Zulus, Not-so-Dead Zulus… unfortunately all the dead British are already painted… and for a last stand I thought it proper to have piles of your own dead littering the place. Another thought I had was The defence of the Brest Fortress in 1941 – at first I thought this might be good as I have painfully few WW2 28mm Soviets to finish up. I have a few dead Russians to paint, I have some shooting pose Germans I could paint (that could be gunning them down…) unfortunately the only live Russians I have are NKVD troops… Which… I guess… might be the last ones standing in the defence of a soviet position…? 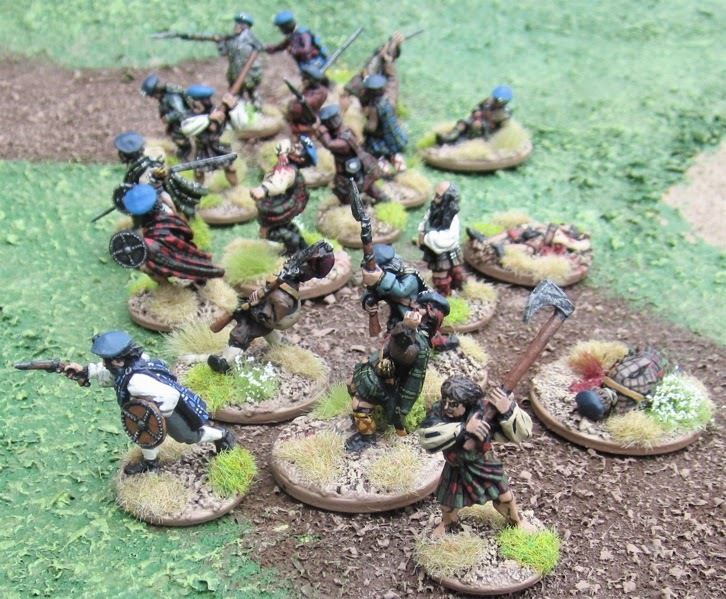 The final charge across the Moor - the skirl of the pipes barely heard over the din of the ferocious shouts and cries of the charging highlanders! 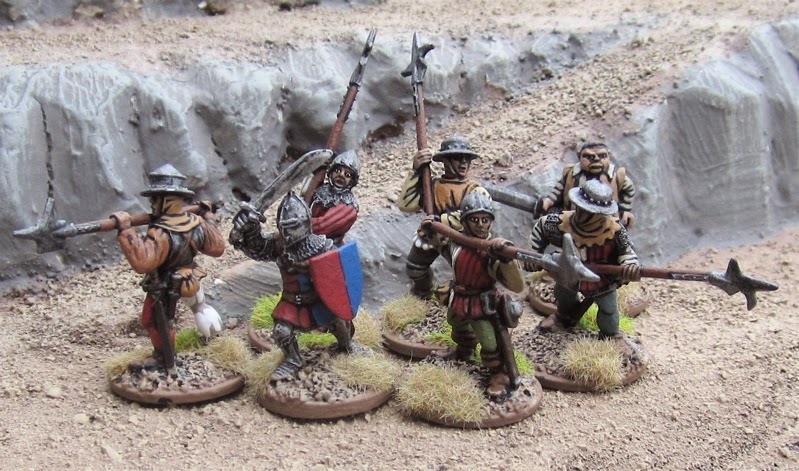 The fighting - Most of these are from Old Glory, though the chap in the middle with the great sword is from Dixon and I think the Piper may be from Wargames Foundry? The two with the Lochaber axes I'm not sure about, but I think might be Old Glory as well. The Falling - I'm pretty sure all but one of these is from Old Glory - the one on the right with the broadsword I think might be from Dixon. The fallen. Two of these are from Front Rank Figures, the other I think is from Dixon. I have a schwack of stuff I’m painting up in a fury to try and get a few more things done before the end of the Fourth Annual Analogue Hobbies Painting Challenge… I also got in a few games of A Song of Blades and Heroes over the weekend but haven’t had a chance to type up game reports… maybe I’ll get to that Thursday after the Painting Challenge is all over.